Record beaten for French startups in the world of finance. According to the statement published at the end of December by KPMG in its Pulse of Fintech France report, the Fintech tricolores raised a total of 365 million euros during the year 2018 through 72 operations. This represents an increase of approximately 15% compared to 2017, when they raised 318 million euros over 61 rounds. By way of comparison, the amount of funds raised by Fintech in France amounted to 135 million euros in 2015, 29 million in 2013 and some 5 million in 2010. "The attractiveness of investors for this sector is thus very clearly confirmed in a very buoyant international context," the report notes. Global figures for the full year 2018 are not yet available, but KPMG already had $ 875 million raised in the first half of 2018, with just over $ 1 billion raised in the first half of the year. whole of the year 2017. 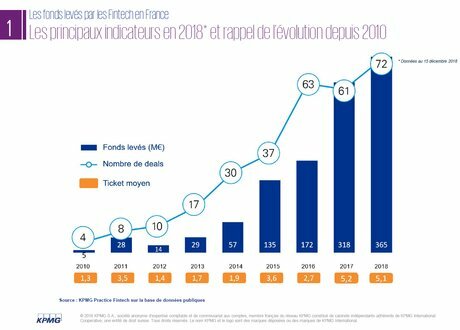 Although the French Fintech has more and more fundraisers, the average ticket per transaction tends to stagnate or even decrease. The average amount of fresh money raised by French startups in the sector thus amounts to 5.1 million euros in 2018, compared with 5.2 million euros in 2017. This average hides disparities since four French Fintech have managed to raise more than 20 million euros over the last twelve months. This is the case of Ledger, specialist in securing cryptocurrency accounts, which has completed a round of 61 million euros. Then come October, ex-Lendix, (32 million), assurtech Alan (23 million) and the neobank dedicated to Qonto companies (20 million). "We now have French champions who finance themselves without much difficulty and who reach critical mass. They are visible and all grow internationally ", rejoices Alain Clot, president of the France Fintech association. For example, October operates, in Spain, in Italy, the Netherlands and soon in Germany. Noticed in France, these operations are still modest compared to some European Fintech. KPMG recalls that the British neo-bank Revolut and the German N26 raised $ 250 million and $ 160 million respectively in the past year - almost the equivalent of the total funds raised by all the Fintech tricolores this year. year! A strike force with which it can be difficult to compete.
" Stronger innovations are thus possible, with models that embark credit, savings, currency, cryptocurrency, and already on several countries "Says the report. A previous study conducted by the firm Exton Consulting confirms this feature: the average amount of the rounds of the French Fintech is generally two times lower than the European average (pulled up by the United Kingdom) and 3.5 less than the average observed in the United States. What explain the absence of " unicorn " (a hyperconsulting company not listed on the stock market and valued more than a billion dollars) French, while the world of Fintech has thirty in the world, including 4 in Europe, according to CB Insights. "This hole in the racket is not inherent to French Fintech but to the French tech ecosystem in general where venture capital has been structured more recently"says Mikaël Ptachek, head of the Fintech practice at KPMG. "It also shows that there are significant investments in younger projects and it's very healthy for the years to come"he adds. According to him, the multiplication of investments in start-up startups would be the consequence of the acquisition of five Fintech in 2017 for about 500 million euros: Account-Nickel absorbed by BNP Paribas, Dalenys by Natixis, KissKissBankBank by La Banque Postale , Credit.fr by Tikehau Capital and Pumpkin by Arkéa. These transactions allowed shareholders to make outings and thus reinvest money in new, less mature projects. KPMG is also attracting investors for new themes. The Blockchain, Assurtech and Regtech sectors thus account for 19%, 12% and 6% respectively of investments in 2018. "In France, Fintech initially developed into the payment, financing and banking 2.0 businesses. We are now witnessing a second wave », analyzes Michael Ptachek. About twenty investment funds have already entered the capital of French startups in finance. BlackFin, Eurazeo, Idinvest, Partech and Newfund are among the most active funds in the field. "For them, the interest is clear: banking and financial services are undergoing a transformation. Innovative actors have the opportunity to provide new services faster than internal development within a larger group where the path is longer. Investors see this as an important source of value creation ", decrypts Fintech practice manager at KPMG. "Intrinsically, we have good fundamentals with excellent engineering background and strong French banks. On the other hand, we are not immune to turbulence on the financial markets that can disrupt the availability of funds for levies in general and in the Fintech in particular. Alain Clot, he is confident for the coming months. "The ecosystem of the French Fintech can rely on several factors of acceleration: the development of new modes of consumption, the French being particularly inclined to these new products, the emergence of French leaders in several market segments and finally Brexit », believes the president of France Fintech. In the longer term, he also relies on French excellence: "French skills in cognitive science or our efficient infrastructures are fundamental assets, very long to build "..
Alan (digital health insurance): 23 million in April. Qonto (neobank for companies): 20 million euros in September. IbanFirst (financial services aggregator for SMEs): 15 million in November. Lydia (payment application): 13 million euros in February. Universign (electronic signature) : 12 million euros in October. Lunchr (dematerialized restaurant tickets): 11 million in May. + Simple.fr (insurance for professionals): 10 million euros in January. LaFinBox (wealth management): 10 million in April. CybelAngel (Cyber): 10 million euros in October. Lemonway (payment platform): 10 millions of euros in July. SpendDesk (management of expenses in company): 8 million euros in January.